Vincent Price made a career playing over-the-top hammy dramatic characters in colorful period pieces in the 1960s. 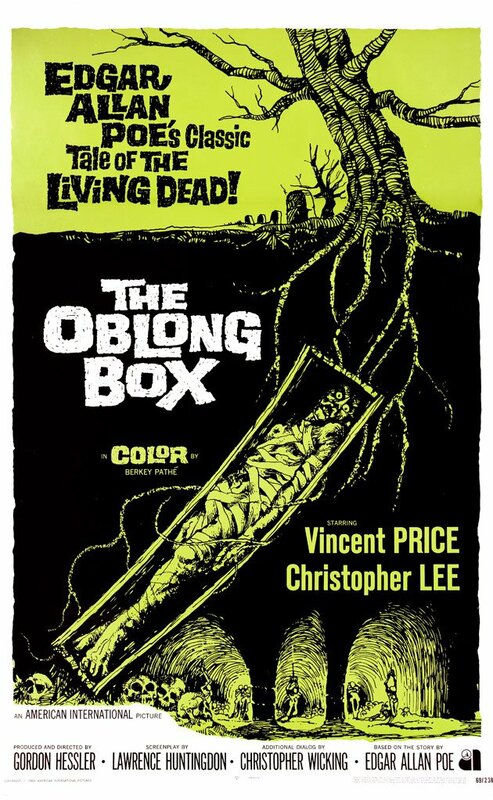 He’s at it again in THE OBLONG BOX (1969), a film in which he is paired with Christopher Lee. THE OBLONG BOX is loosely based on the Edgar Allan Poe short story of the same name—very loosely, as in just borrowing the title! The story begins in Africa, with Sir Edward Markham (Alister Williamson) tortured by natives, his face apparently scarred beyond recognition. Markham’s brother Sir Julian Markham (Vincent Price) arrives too late to save him. They return to England, with Sir Edward now a crazed lunatic. Sir Julian is forced to keep his brother locked in chains in an upstairs bedroom of their mansion. With the help of a family friend Samuel Trench (Peter Arne), Edward plans his escape. They hire an African witch doctor to supply Edward with a drug to imitate death. The plan is for Edward to be removed from the house as a “corpse” only to be revived and rescued later by Trench. However, Julian immediately seals Edward’s lifeless body inside a coffin and unknowingly buries his brother alive. Trench decides rescuing Edward from a premature burial is too dangerous and out of the question, and so he leaves him for dead. Meanwhile, Dr. Neuhartt (Christopher Lee) has been paying grave robbers to supply him with bodies for his research. As luck would have it, his grave robbers dig up Edward. When Neuhartt opens the coffin inside his laboratory, Edward attacks him but doesn’t kill him, deciding he could use the doctor as an accomplice. Edward then dons a crimson hood and seeks revenge against both Trench and his brother, going on a bloody rampage through the countryside, slitting the throats of his victims. Eventually, Julian discovers his brother is still alive, setting the stage for the final confrontation between brothers, as well as the obligatory unmasking of Edward’s hideous face. THE OBLONG BOX has long been considered too long, too slow, and too rambling by critics, but I’ve always liked its intricate plot with its many pathways. It takes the viewer along a very creepy ride, with premature burials, African voodoo, a masked maniac, and bloody murders. THE OBLONG BOX was supposed to have been directed by Michael Reeves, the talented young director who had just finished another Price movie, THE CONQUEROR WORM (1968) [also known as THE WITCHFINDER GENERAL), a film that had been very well received. Sadly, Reeves died before he could direct THE OBLONG BOX, and so the directing duties went to Gordon Hessler. A lot has been made of Hessler’s lackluster direction of this picture, and I would have to agree. In spite of its strong story, there really aren’t a lot of memorable scenes in THE OBLONG BOX. On the contrary, there are a lot of weak scenes. The bloody killings are tepid and the blood obviously fake, and the final confrontation between Edward and Julian is also a disappointment, as well as the unmasking scene. The make-up job on Edward’s face is embarrassingly routine. Still, Hessler can direct. Five years later, he would be at the helm of THE GOLDEN VOYAGE OF SINBAD (1974), one of the best of the Ray Harryhausen Sinbad movies. The acting is just OK. With Vincent Price, you get exactly what you would expect, an over-the-top hammy performance. As always, he’s fun to watch. Christopher Lee is cast against type as the decent Dr. Neuhartt, but sadly, there’s not a lot for him to do with this role. Alister Williamson is a disappointment as Sir Edward Markham. As the main villain, Edward should dominate this movie. He doesn’t. Had Christopher Lee played Edward, THE OBLONG BOX would have been a much better movie. Of course, I can understand Lee not always wanting to play the bad guy. Trouble is, he’s just so damned good at it! I wish he had played the role. Speaking of bad guys, probably the most memorable performance in THE OBLONG BOX belongs to Peter Arne as Samuel Trench. Trench is the slimiest character in this movie, and Arne plays him to the hilt. But the most disappointing part of this movie is that in spite of the pairing of the two horror superstars, Price and Lee only share one brief scene together. Rip-off! And the final nail in the coffin— heh, heh— regarding THE OBLONG BOX is that its ending doesn’t make any sense. It’s one of those endings where you see it and you know it was shot just to have a shocking last scene, even though based upon what has happened before, it makes little or no sense. But even with all these flaws, I still like THE OBLONG BOX, for the simple reason that I love its plot, an exciting roller coaster ride of frights and thrills. The screenplay was written by Lawrence Huntington, with additional dialogue by Christopher Wicking. THE OBLONG BOX is an example of a movie that succeeds because of the strength of its writing. The direction is fair and the acting okay, but it’s the writing that lifts this one to memorable status, which is a rare thing in movies, a medium dominated by directors and actors. 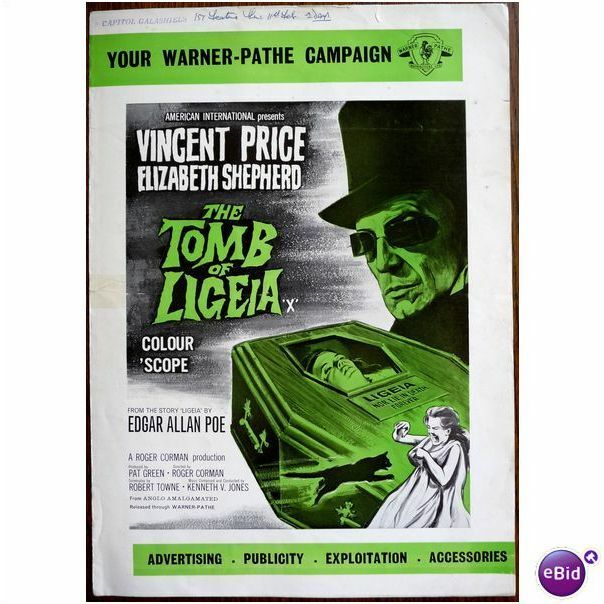 This is a reprint of a column that originally ran in the October 2007 issue of The HWA Newsletter, on the Vincent Price movie THE TOMB OF LIGEIA (1964). It’s reprinted in the current October 2015 issue of the HWA Newsletter as well as here. And don’t forget: if you like this column, you can read 115 more in my IN THE SPOOKLIGHT collection, available both as an EBook (www.neconebooks.com) and in a print-on-demand edition (https://www.createspace.com/4293038.). I prefer horror to be an emotional experience, which is why, sometimes Roger Corman’s Edgar Allan Poe adaptations don’t work for me. THE TOMB OF LIGEIA (1964), starring Vincent Price, Corman’s eighth and final Poe adaptation, is a perfect example. Technically, the film is flawless. It’s arguably Corman’s best job at the helm. The film looks phenomenal, there’s great use of locations, and the camera work is extremely stylish. For these reasons alone watching THE TOMB OF LIGEIA can be as rewarding and mouthwatering as reading a good novel. Your intelligence won’t be let down. It also has a decent screenplay by Robert Towne, which lives up to its source material. However, THE TOMB OF LIGEIA has never been one of my favorites because as it plays out, it’s as cold as a corpse with about as much life (unless of course you’re talking vampire and zombies, which get around rather well, but there ain’t no vampires or zombies here!). Perhaps this is on purpose, and perhaps it’s just another sign of Corman’s genius. Could be. But for me, the fact remains that as I watch THE TOMB OF LIGEIA, and as I recognize while watching that “hmm, this movie is extremely well made,” I also realize I’m not emotionally invested in the characters or the situations. THE TOMB OF LIGEIA tells the story of Verden Fell (Vincent Price) who’s— what else?— brooding over the death of his wife, Ligeia. When a new woman, the Lady Rowena (Elizabeth Shepherd, in a dual role, as she also appears as Ligeia) expresses interest in Verden, the ghost of Ligeia takes offense, setting off the usual, standard ghostly shenanigans. We learn that Verden isn’t mourning his deceased wife— he’s afraid of her, afraid that she’s not really dead. Turns out Ligeia was a bold, energetic woman who had asserted she would never die, and she definitely got inside Verden’s head. It’s this part of the film that works best for me. Is Ligeia really a ghost? Or is it Verden? So mind-washed by his deceased wife that he himself is causing the mayhem? On this level, the film works well. And the performances by the two leads are terrific. Price stands out as Verden. His look, with the dark brown hair and dark glasses, to shield his ultra-sensitive eyes from the light, is unique to this movie. Price moves through this role effortlessly, as if he could do it in his sleep. 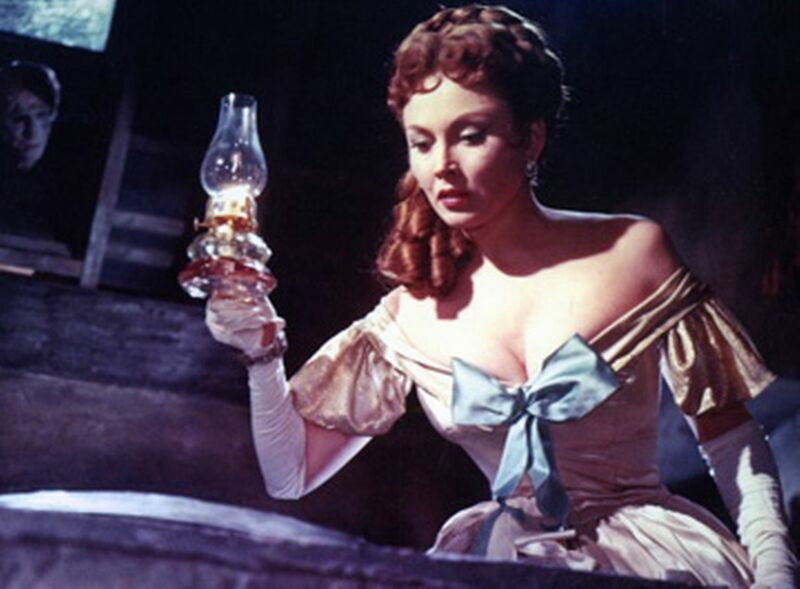 Elizabeth Shepherd is just as good as The Lady Rowena. Her portrayal of Rowena as a strong woman who is not intimidated by evil spirits is refreshing. But THE TOMB OF LIGEIA fails to connect on an emotional level. Price’s Verden isn’t that likeable, and while Shepherd’s Lady Rowena is, she’s not a central enough character to carry the movie on her own. I don’t really care about these characters, and as a result, I don’t care all that much about what happens to them, which makes for a lackluster movie viewing experience. 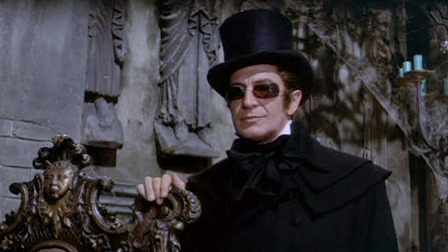 THE TOMB OF LIGEIA is a mixed bag, which for Halloween, is OK. In a trick or treat bag, chances are you’ll get candy you’re not crazy about along with your favorites, but still, it’s candy, and you’re not going to throw it away. Likewise, THE TOMB OF LIGEIA is a stylish, almost beautiful horror movie that is pleasing to the eye and to the intellect, but not so attractive to the heart. For those of us who tell tales, the heart can be the difference maker. Still, it’s Corman, it’s Price, it’s Poe, it’s candy. Peter Cushing, Christopher Lee, and Vincent Price all share birthdays in May: Cushing on May 26 and both Lee and Price on May 27. Last year to celebrate this occasion we looked at movies in which all three stars, Peter Cushing, Christopher Lee, and Vincent Price appeared together. It was a brief list, since it only happened twice. This year to honor their birthdays we’ll look at movies starring Vincent Price and Christopher Lee, and movies starring Vincent Price and Peter Cushing. This list is brief as well. Believe it or not, there’s just one. Lurid tale about premature burial, voodoo, and revenge in this story about a vengeful brother who goes around terrorizing the countryside while wearing a red hood. 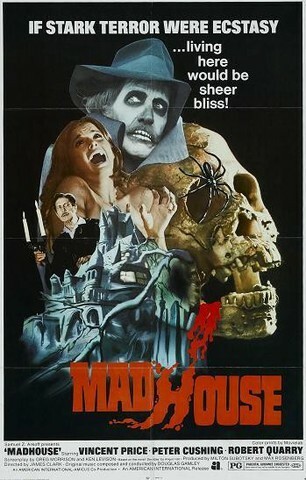 Vincent Price plays the lead, the man who tries to control his lunatic brother but constantly does more harm than good. Christopher Lee is solid in a supporting role. This film would have been so much better had Lee been cast as the evil brother Edward. Still, as it stands, this flick is a heck of a lot of fun. 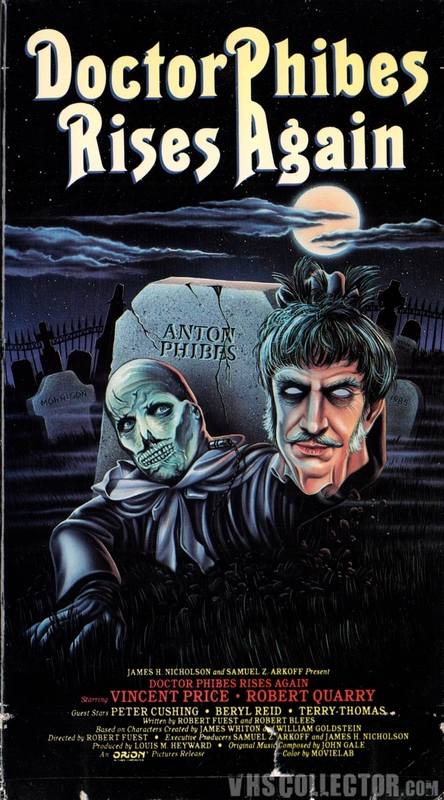 Sequel to THE ABOMINABLE DR. PHIBES (1971) isn’t as good as the first one but comes darned close! Barely counts as a Price/Cushing pairing, since Cushing’s role is only a cameo. Blink and you miss him. Once again, Price steals the show as Dr. Phibes. Robert Quarry adds fine support as Phibes’ rival. Price, Cushing, and Quarry are reunited in this effective yet flawed thriller about a horror actor (Price) making a comeback in the midst of a series of murders which seem to implicate his famed alter ego from horror movies of old, Dr. Death. An odd movie. At times, it’s really good, but at others it’s aimless and without direction. The best part is finally, at long last, both Price and Cushing have sizable roles, Price as the haunted horror film star, and Cushing as his friend and screenwriter. They get to spend considerable screen time together. Sadly, neither of these movies is very good. But you can’t beat the cast!